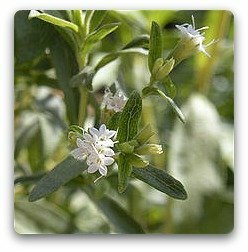 The genus stevia consists of two and hundred and forty species of plants which are indigenous to Central America, Mexico and South America. Numerous species have been found as far as New Mexico, Texas, and Arizona. This article is about the stevia plant known as stevia rebaudiana. kaa jheéé, caa-he-éé, ca-a-jhei, honeyleaf, capim doce, azucacaa, ca-a-yupi, capim doce, honey yerba, sweet-herb, candy leaf and ya waan. As some of the names suggest, stevia is used as a sugar substitute and a sweetener. The Guarani tribes of Bolivia, Brazil and Paraguay have been using ka'a he's (their name for stevia) for hundreds of years. It is also used for heartburn, bruises, burns, acne and other skin problems. Additionally it has been used to treat diabetes in traditional Chinese medicine and Paraguayan traditional medicine. Stevia is available in a range of forms, including as a liquid extract, powdered extract fresh or dried leaves. Recently liquid stevia has gained increased attention and use. A placebo-controlled, randomized, double blind study was done consisting of 106 Chinese people with high blood pressure. The age range of the group was between 28 to 75 years old. 60 people took stevia treatment the rest of the group took the placebo. The results showed that those who took stevia decreased their blood pressure considerably and it persisted throughout the whole year. A study published in the Bangladesh journal of veterinary published a study involving diabetic rats. The rats were given stevia in powered form, along with a drug called glimepiride. Stevia produced major hypoglycemic effects on the rats compared to the glimepiride drug. In 1991 the United States Food and Drug Administration banned stevia after getting an anonymous industry complaint. The FDA said "toxicological information on stevia is inadequate to demonstrate its safety." In 2009 the FDA stated that they consider stevia safe. In 1999 the European Commission banned stevia as food. Hong Kong and Singapore have banned it also. As of 2011 no side effects have been reported. The 2006 report by the world health organization (which can be seen in the link below) would suggest that the EC, Singapore and Hong Kong policies are obsolete.